When it comes to hunting raccoons, the Treeing Walker Coonhound is unsurpassed. On the hunt, they chase raccoons (or other small woodland animals) up trees and bark their distinctive bark until their owner arrives. Their speed and sharp scenting skills have made them the most popular dog for raccoon hunting competitions. Energetic and driven, TWCs are appropriate only for experienced dog owners with the time to train and exercise them frequently. When kept physically and mentally active, Walkers are playful, loving, and sometimes goofy companions. Between hunts, training sessions, or walks, they'll lay on the couch or their dog bed resting up for their next outing. While laid back, TWCs are prone to raucous bouts of barking. The breed varies socially: some Walkers are shy, others are outgoing. Treeing Walker Coonhounds are also called Walkers and TWCs. Coat – Treeing Walker Coonhounds have a smooth, short and glossy coat that is dense enough to protect them from briars on the hunt. The coat color is a white, black, and tan tri-color. White or black may be the predominant color. TWCs are alert, athletic dogs who are rugged enough to track raccoons through dense underbrush on the hunt. They have a powerful build without any hint of stockiness. The Treeing Walker Coonhound's ears are low set and the rounded tips reach almost to the nose when the head is down. Their dark eyes are large and have the alert, yet gentle expression common to hounds. The Walker's long legs offer them power, speed, and endurance. Their temperament is focused in the field and easygoing at home. TWCs are descended from English Foxhounds brought to America by British colonialists. Originally known as English Coonhounds, their name was eventually changed in honor of Thomas Walker, who was influential in the breed's early development. Though TWCs have long been the most popular of the raccoon hunting breeds, the American Kennel Club did not officially recognize them until 2012. Treeing Walker Coonhounds are loving and laid back, as long as they are given the opportunity to hunt. Walkers have a competitive streak and they love showing off their skills in the field. If you don't hunt raccoons with your Walker, it's imperative you give him plenty of exercise and mental stimulation every day. When bored, TWCs will bay and bark to draw their beloved people back home. Are Treeing Walker Coonhounds Good with Kids? TWCs are amiable with children. But this energetic breed is best suited to families with older children who know how to treat dogs well, and aren't likely to pull on the Walker's long ears. Are Treeing Walker Coonhounds Good with Other Pets? Treeing Walker Coonhounds enjoy the company of other dogs, especially when they've been socialized with them from an early age. They are a danger to cats and other small animals, however, because their hunting drive is so strong. Treeing Walker Coonhounds are not very protective or territorial. Are Treeing Walker Coonhounds Good Guard Dogs? Though highly alert in the field, Treeing Walker Coonhounds don't stay on the lookout for intruders at home—unless it's a raccoon trying to get to the garbage. TWCs have an abundance of energy and require a great deal of attention and activity. Indoor Treeing Walker Coonhounds are highly attached to their families and should live indoors with them. Though energetic, TWCs are generally mellow at home as long as they get plenty of exercise and attention throughout the day. Because of their intense need to exercise, they don't make a great choice for apartment dwellers. They shed moderately, so fur cleanup is minimal. When a TWC gets back from the hunt, however, he'll need a wash before entering the house. Outdoor Treeing Walkers should spend the majority of their day outdoors involved in hunting or other dog sports with their people. It's helpful to have a large, enclosed yard where they can stretch their legs and exercise. Don't leave them alone outside for very long; TWCs get bored quickly and will search for adventure on their own. They are also champion climbers and can scale fences or trees near the fence to escape. Additionally, lonely TWCs will bark and bay—a ruckus that carries a great distance. Exercise A healthy, adult Treeing Walker Coonhound requires more than two hours of physical activity and training each day. In addition to raccoon hunting, TWCs are skilled athletes in most dog sports. Endurance Treeing Walkers have the stamina for lengthy raccoon hunting competitions, hikes, and play sessions. You don't have to worry about your TWC running out of steam. Running Miles: A healthy, fully grown Treeing Walker Coonhound makes an excellent running partner. TWCs have the athleticism and energy to run five miles and more. Hiking Miles: Treeing Walkers have the stamina for half or full day hikes. Expect to take a zig-zagging route as your TWC tries to follow fresh scent trails after woodland critters. Food The dietary needs of a Treeing Walker Coonhound who hunts will vary significantly from one who takes long daily walks. Talk to your veterinarian about the optimal diet and quantity of food for your Treeing Walker's activity level. TWCs should eat two meals daily. Alone Time Though courageous, Treeing Walker Coonhounds get bored quickly when left alone. They crave interaction and activity throughout the day. It's ideal to have a family member with them all day, if possible. The Treeing Walker Coonhound's short coat doesn't require much upkeep. Brushing once a week and wiping him down after a hunt will keep the TWCs coat healthy. Give him a bath whenever his 'doggy odor' becomes noticeable. Wash your TWC's ears weekly with a gentle, dog-friendly cleanser to prevent dirt buildup that can cause infections. Brush his teeth several times a week, and trim his nails every month or so to prevent painful cracking. 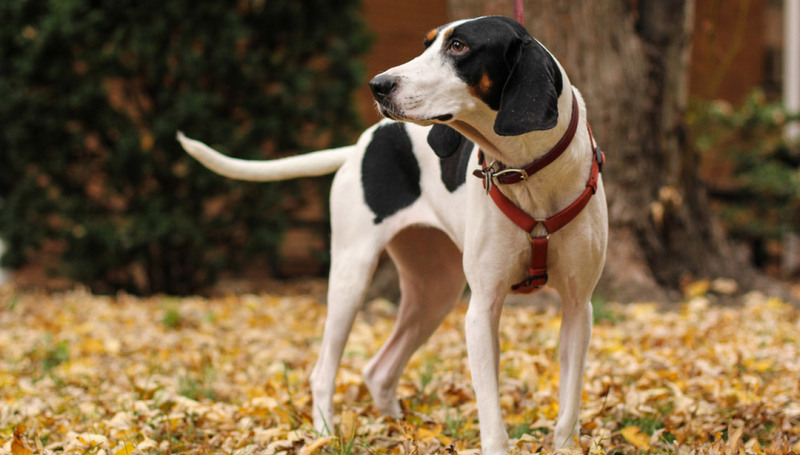 You can minimize serious health concerns in a Treeing Walker Coonhound by purchasing from a reputable breeder who engages in responsible breeding practices, and through screening for common diseases and conditions. Treeing Walker Coonhounds are intelligent and train quickly with the help of experienced owners who understand their high energy and hunting instincts. Walkers get bored easily and are food motivated, so it's helpful to keep training sessions interesting and offer abundant rewards in the form of dog treats. Advanced obedience training is important for this breed as it keeps them active and mentally challenged. Raccoon hunting training and competitions, most dog sports, and agility training are all excellent choices for your TWC. While best at tracking raccoons, most Treeing Walker Coonhounds can be trained as skilled upland hunters. Are Treeing Walker Coonhounds hypoallergenic? No. Treeing Walker Coonhounds shed and, as a result, leave pet dander in your home. Pet dander is the primary cause of pet related allergies. Do Treeing Walker Coonhounds climb trees? Yes. The Treeing Walker Coonhound's job is to chase raccoons up a tree and wait at the bottom of the trunk, barking loudly, until the hunter arrives. But some walkers are known to get impatient and climb the tree after their quarry themselves. Can Treeing Walker Coonhounds swim? A versatile athlete, Treeing Walker Coonhounds usually enjoy swimming in addition to land-based sports. Always watch your TWC closely when he is in or near the water.